Earlier this year, PHE Screening’s inequalities strategy was launched to highlight our commitment to reduce inequalities in access to screening services. 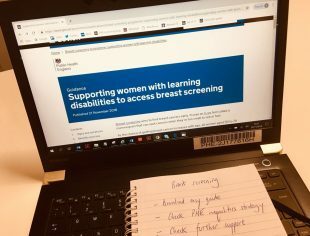 Today, we are pleased to announce the publication of new national guidance and information to help local breast screening providers support women with learning disabilities. This is the first part of a toolkit of resources that will help services to tackle inequalities locally. Breast screening reduces the number of deaths from breast cancer by finding signs of disease at an early stage. National uptake of breast screening (the number of women who attend their appointment) is around 70%. However, evidence has shown that uptake is lower in women with learning disabilities compared to the rest of the population. Primary care play a crucial role in addressing screening inequalities, by identifying women who require additional support so that breast screening services can put that support in place. Women with learning disabilities can face many barriers to accessing screening, including lack of understanding which prevents them making an informed choice about whether or not to accept their invitation. As part of the new national guidance, we have now published an easy read invitation/appointment letter that can be printed out and sent to women with learning disabilities along with a copy of the easy guide to breast screening leaflet. There is also information about reasonable adjustments, making a best interest decision, links to relevant legislation such as the Accessible Information Standard and Equality Act, and links to lots of other useful resources. This is only the first stage of the breast screening inequalities toolkit. Watch this space for more resources over the coming months. We already have similar guidance for cervical screening and abdominal aortic aneurysm screening providers. We also plan to develop national guidance for antenatal and newborn screening providers, bowel cancer screening providers and diabetic eye screening providers, along with easy read invitation/appointment letter templates for all the young person and adult screening programmes.